Enroll at the Welcome Center! St. 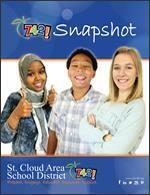 Cloud Area School District 742 is an open enrollment school district and welcomes all resident and non-resident students to its schools. Whether a family is enrolling a soon-to-be kindergartner in the all-day, everyday Kindergarten program or is new to the area and has children entering grades 1-12, the Welcome Center can help. The Welcome Center provides assistance in enrolling new students and can provide assistance, services and referrals to prepare them for school. The Welcome Center is open Monday through Friday from 7:30 a.m. to 4:30 p.m. The Language Immersion program is available for Spanish at Clearview Elementary School and Mandarin Chinese at Madison Elementary School. In the school, students are immersed in Spanish/Chinese while they learn mathematics, science, reading, writing and other curriculum. Immersion means that teachers communicate only in Spanish/Chinese while teaching students. For more information or to schedule a tour, contact Madison Elementary for Mandarin Chinese Immersion at 320-252-4665 or Clearview Elementary for Spanish Immersion at 320-743-2241. 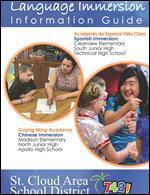 Visit our Language Immersion website for more information. Early childhood screening can begin as early as age 3 and is part of the kindergarten enrollment checklist. To schedule an appointment online click HERE or call 320-370-8250. To attend District 742 as a non-resident, or a resident student who wants to attend a school other than their attendance school or a student wanting to attend language immersion, an application must be submitted and be approved for a transfer before enrolling. Questions? Call the Welcome Center at 320-370-8116.